Ramy Salemdeeb, BEng (Hons), MSc, MCIWM ISWA, is a solid waste management consultant with a focus on post-conflict zones and developing countries. He is the founder of Zero Waste MENA. Ramy is currently a PhD researcher at Cambridge University. Tagged AD, Anaerobic digestion, CHP, Composting, Defra, emissions, Food, Food Waste, Food Waste Management in UK, GHG, Landfill, Landfill Directive, Retailers, Supermarkets, Tesco, UK, Wastes, WRAP. Bookmark the permalink. There is a strong correlation between affluence and environmental impact. This is not only due to increase in direct use of resources such as electricity and water but also increased consumption of goods and services across the board. The figures mentioned in the article are shocking. My kids had spent most of their time in kindergarten while growing up in Australia. There, they had been taught not to eat the crusts of the bread and many a times they had seen their kindergarten teachers throwing those away while preparing sandwiches for them. It took me nearly two years to change their behaviour and make them eat the crusts. The goods and services that we buy everyday can make significant contribution to environmental impacts. There are means to make affluent societies and individuals more environmentally responsive. Education and awareness are the means to smart consumption. By being deliberate in what we choose and being reflective and conscious of the environmental and financial implications of our patterns of consumption can help to reduce our contribution to negative environmental impacts. It’s appalling to learn how food is wasted at different stages. 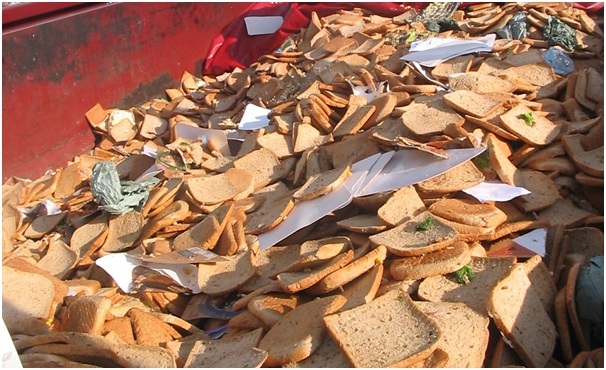 In the developed world, food is thrown away during processing and from our plates. In the developing world, food is wasted because of transportation and storage issues. In any way, we end up wasting 30-40% of food produced in the world. Making this available to the starving billion will Improve social order, human development and thus solve worldwide unrest that is growing sighting different reasons. We need a global campaign to stop wasting food in any form and at any stage; change of habit, distribution and storage infrastructure and the last mile journey to the plates of billion going to bed hungry every night. Food waste is a silent menace, as it contributes to green house emissions, and is an increasing burden on already over-filled landfills. Anaerobic digestion is good, but very cost intensive to set up…Can municipalities take note of this and help in setting up of several of these? The vastness of Food waste can be easily seen at the end of a so called big fat Indian wedding. A simple way to reduce it is just by sharing the left overs with roadside beggars, etc.